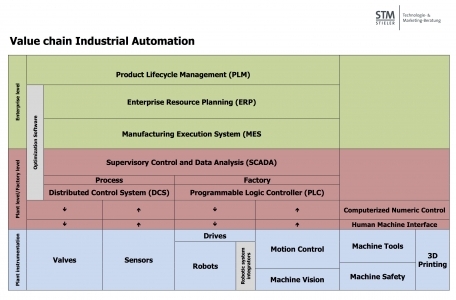 In this new study, we investigated the entire value chain of industrial automation in China. In total, more than 900 foreign and domestic companies identified and analyzed - from the level of business software (PLM, ERP, MES, optimization software) via the controls at the factory level (SCADA, DCS, PLC) to the periphery on the shop floor (CNC systems, HMIs, Drives, robots, motion control, machine vision, machine tools, 3D printers). We also identified and describe the most important system integrators, who bring together the various components and install them on the shop floor. The analyzed segments are shown again in the following graphic. Market dynamics - how has the market developed? Why? Who are the major players in each segment? Where dominate foreign companies, where Chinese? In which areas, Chinese companies are catching up? Which technological hurdles are there? What growth can be expected for the next five years (company expectations, markets prospects, own calculations)? Which Chinese names in the field of industrial automation should you remember? And why? Which system integrators are there? In which applications and industries do they already have experience? Who are their reference clients? What specific Chinese character features of industrial automation, or one step further, Industrial Internet can be observed? What new business models are now starting already?